We are in the very. last. stretch. of this pregnancy and I couldn't be happier that we'll soon be meeting our baby girl. And by soon, I mean IN FIVE WEEKS. I'm still scratching my head and wondering how the heck I've arrived at 34 weeks. It seemed like just yesterday we found out we were expecting. Weight Gain: +1 lb. this week. Mama ate well this past Labor Day weekend : ) Thank the Lord for the delicious foods of football season! Baby's Growth: We don't have another biophysical profile until next week, so I'm not sure. Our doc estimates she's around 4.75 or 5 lbs. now! Cravings: Blue Gatorade. Weird, right? I've been SO thirsty due to this crazy hot weather we've been having. And pickles. And queso and chips. But not all together. That would be gross. How I'm Feeling: Well friends, we had a great run, but I've now reached the stage of pregnancy where I'm a little bit...uncomfortable. It hurts to bend over - ha! With only five weeks left though, and a fairly smooth third trimester, I really can't complain. Movement: She's definitely living in close quarters in there now, so her movements aren't really kicks anymore, but rather just her squirming. TMI, but I want this for my records: baby girl dropped into "position" over the previous weekend and WOAH NELLY - ouch! Favorite Moment this Week: It sounds funny, but my favorite moment this week was getting her carseat in the mail. Stephen said last night, "Oh man, this means we'll have a tiny person to put in this seat!" He's right; we will. 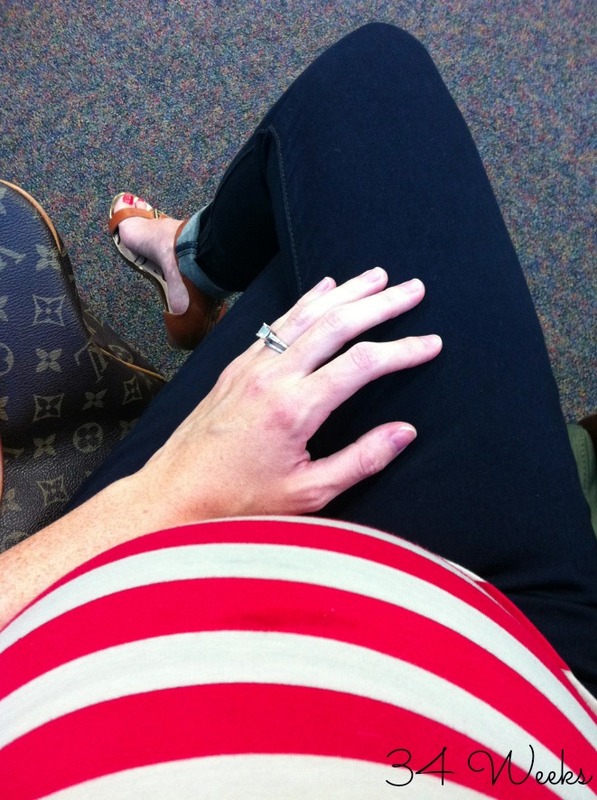 Clothes: Pants are all maternity and I'm now wishing I'd invested in more maternity shirts. Ever since she dropped, my tops are all too short! I think a run to Pea in the Pod may be in order this weekend. Most looking forward to: October 14th...Caroline's birthday! Thankful for: The return of college football, which has positively nothing to do with our baby, but is MUCHO enjoyable, nonetheless. Update: I think since I'll be adjusting to life with a bambino for the majority of this fall, I'm going to skip posting a topic schedule. So, CF will go back to the way it was previously where we just confessed what we wanted. It seemed like there was a bit more participation before the topics too, so feel free to write about what you want! Blue gatorade is the ONLY flavor that should be in production. Also a great hangover helper! HA! Yay for October 14th - that's a great birthday to have! It's not too close to the holidays, but it's well enough into the school year that she will always have fun celebrating it with her friends (this coming from a summer baby who never got to celebrate birthdays while in school!) Can't believe her arrival is getting so close:) I was with you on the lack of shirts toward the end of pregnancy. I thought I would be fine til the end with baby boy, but suddenly one day, it was like nothing fit anymore (at least not well enough to comfortably cover the bump to my standards). You can do it Mama! Just a couple more weeks! your bump is adorable. So excited for you!